(Portland, Maine)- This year's J/24 Downeast Regatta will be the U.S. J/24 Class Northeast Regional Championship where the top teams not already qualified in the Northeast Region will qualify for the 2015 J/24 World Championship in Germany. 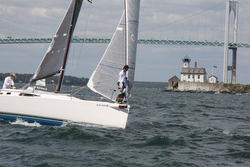 The event is hosted by Portland YC and sailed on the spectacular Casco Bay. 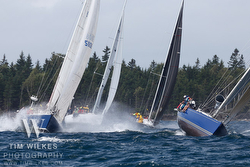 Also, the Downeast Regatta in 2015 will be the site and event for the 2015 J/24 North American Championship being sailed from September 10-13 (more news here- http://www.2015j24nas.org). The regatta organizers expect strong participation both this year and next with its close proximity to the 2014 Worlds (Newport) and 2014 Nationals (Buzzards Bay), both about 3.5 hours driving distance to their site in Southern Maine. 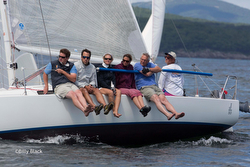 On average the Downeast Regatta sees 30 boats and about 6 races with very strong competition. With similar currents and conditions to the Newport World’s inside courses it is a perfect event for tuning your team and boat. Be sure to note that FREE hosted housing for boats is provided to “out-of-town” J/24s on a first-come, first-served basis. J/100 SMITTEN & J/80 CHAISE LOUNGE Class Winners, too! (Rockland, Maine)- And what a party it was for the crew aboard Ben Blake’s magnificent J/160 ATLANTIC. The gorgeous french blue hull beauty sliced through the cobalt blue waters of Penobscot Bay with ease on her way to winning the largest class in the regatta- PHRF Cruise division! 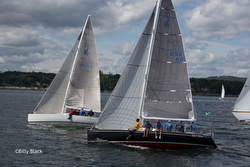 Once again the parties and entertainment were memorable as were the spectacular days of racing on the scenic waters of western Penobscot Bay. Co-hosted by Wayfarer Marine and Lyman-Morse Boatbuilding, the three-day regatta enthusiastically enjoyed local food specialities (lobstah’s!) along with evening dancing and fireworks. In the Spinnaker Division 2, Shane Flynn’s J/100 SMITTEN walked off with all bullets, beating out her sistership, the J/100 SEA SMOKE sailed by Cabot Lyman, that took 3rd in class. Fourth was Mark Scheffer’s J/40 LEGACY. The Spinnaker Division 3 was over-run by local knowledge, with Jesse Henry’s J/80 CHAISE LOUNGE taking two bullets to win their group. Then, Patti Spaulding’s J/24 HAVOC took two seconds to secure the silver. Finally, in the Spinnaker Division 1 Double-handed division, Scott Miller’s J/122 RESOLUTE took fourth and Doug Coleman & Chris Holm’s pretty J/46 SKITTERYGUSSET took fifth. 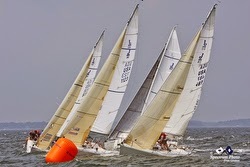 (Annapolis, MD)- Over the course of a three week period, the International J/80 Class will be hosting two massive events on their calendar on the Chesapeake Bay, with their North American Championship hosted by Annapolis YC from September 10th to 14th and the World Championship hosted by Eastport YC from September 25th to October 4th at Eastport YC. While predominantly a North American affair, both events will feature a “who’s who” of top J/80 teams from the past few years. The J/80 NA’s have 25 boats registered while the J/80 World’s have 30 teams scheduled to start; there’s about 95% overlap between the two as many are using the NA’s as a “pre-Worlds” practice regatta. First up are the NA’s. 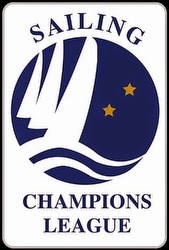 The local talent includes top teams like Mike Hobson’s MELTEMI, Bert Carp’s ELEVEN, David Andril’s VAYU and the trio of Will & Marie Crump & Tom Klok sailing WHO’s HEIDI (the current J/80 NA champions). Top visiting teams will be Nizar Abuzeni’s ARROW (St Paul, MN), Tod Patton’s BLONDIE (Northbrook, IL), Tim Mahoney’s CANNONBALL (Staten Island, NY), Chris & Liz Chadwick’s CHURCH KEY (Weston, FL), Gary Panariello’s COURAGEOUS (Manhasset, NY), Forbes Durdin’s MOJITO (Houston, TX), Kevin Hayes’ MORE GOSTOSA (Gilford, NH), Terry Flynn’s QUANTUM RACING (a team from League City, TX that are also past World Champions), David & Elisabeth Neasmith’s SEQUEH (Nepean, Ontario, Canada), and Bill & Shannon Lockwood’s SHENANIGANS (Holmdel, NJ). J/70 Sailor Heather Gregg-Earl Dominates Nantucket Regatta! (Nantucket, MA)- The annual Nantucket Race Week IOD Celebrity Invitational Regatta on August 14-15 once again attracted an elite list of accomplished North American sailors to serve as tacticians for skippers and teams in a benefit for Nantucket Community Sailing. Organizers generally don’t make the same skipper/tactician pairing two years in a row, so when skipper Heather Gregg of Stage Harbor YC won in 2012 with Celebrity Tactician Robbie Doyle, she couldn’t test the magic last year. But when the two paired up again last week, the magic was alive again, never finishing worse than second, winning the 14 boat event without sailing the final eighth race. Nantucket Sound delivered optimal race conditions for the fleet of International One Design sloops, with 15-17 knot westerly winds and moderate seas. Gary Jobson helming, with Jud Smith calling the shots, took second, begging the question “Which ones aren’t celebrities?” Peter Bromby of Bermuda as tactician, with skipper Ted Moore of Marblehead, both first-timers at the event, took third. The consistency of top finishes, amongst the deep and high level competition, earned Heather Gregg-Earl the “Nantucket Race Week Overall Best Performance Award” from event sponsor Porsche cars. (Hamburg, Germany)- From 29 to 31 August, the best German sailors in the J/24 class are expected to sail at the NRV Champions Week on the Baltic. The organizers, Norddeutscher Regatta Verein (NRV), expect more than 200 participating sailors. The J/24 German Open is taking place out of the Bolton Marina, one of the most modern ports on the Baltic coast and longtime partner of the NRV for many of its sailing events. This remarkable marina was opened in 2008, designed by the architect Andreas Hundsdörfer from the outset as regatta hosting site and offers excellent facilities for participants and spectators. "We wish the participants exciting race days and are already looking forward to the 2015 J/24 World Championships soon,” says Mr. Hundsdörfer. 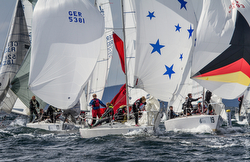 Top German Sailors in J/70 Bundesliga- It’s a Matter of Honor! 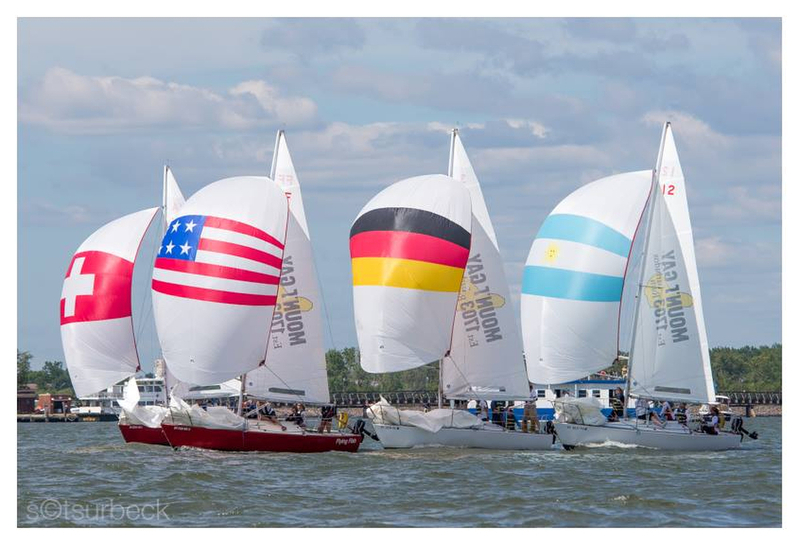 (Berlin, Germany)- The Deutsche Segel-Bundesliga and its 18 sailing clubs will next be stopping on the Wannsee in Berlin, Germany with its fleet of J/70s. 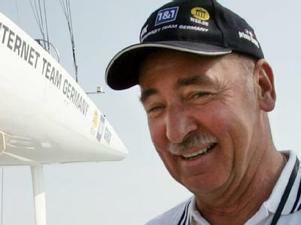 Included are two sailing icons from Berlin who have made a ​​lasting impression in the world of sailing. This coming weekend is a time of great memories. In the Bundesliga, racing on the Berlin Wannsee will be three-time Olympic gold medalist Jochen Schumann. It’s the first time since 2000 in the Sydney Olympic Games that he will sail with Gunnar Bahr and Ingo Borkowski in the same boat. Their fourth crew from the YC Berlin-Grunau will be Erik Powilleit. With Bahr and Borkowski, Schumann had won his fourth medal in Australia. That it was the Silver Medal “only", Schumann attributes today to several "bad nights”. What is his objective for the regatta on the Wannsee, with his club positioned in third place overall in the Bundesliga? "We, of course, go take a risk," says Schumann. Anyone who has won an Olympic medal should be able to prevail in the Bundesliga. But, this will only be possible from an America's Cup winner's view, when the wind blows strong on the Wannsee. "Then, we are well positioned," says Schumann. During calm periods the boat from Grunau might have a distant chance, because the sailors on competing young sailors from other clubs are too competitive! That Schumann, who lives in Penzberg, near Munich, returns for the third event of the J/70 Segel-Bundesliga this season in his home, is typical of the Bundesliga regatta. "It's a super nice format that everyone understands," says the former Olympic Champion and Fourth Vice President of VSaW, Ulrike Schumann (un-related to Jochen Schumann, by the way). Ulrike Schumann will just be a tactician on board their team and she is looking forward to the debate with her famous namesake. In fact, a new esprit de corps has evolved. The same four sailors do not always sail for their respective clubs. For example, Jochen Schumann, was crew last year for a young women sailor on their club team! The juggling of top sailors is one of the reasons why the interest in the clubs of the Bundesliga racing is sustainable and broad. "To be allowed to sail for my club, is an honor for me," explains Ulrike Schumann. “Our club’s participation leads to a greater awareness. The competitions have a huge role in developing that interest,” she says. The situation is similar to the creator of the Deutsche Segel-Bundesliga, the former Tornado World Champion, Oliver Schwall. There were several advantages of the fledgling Sailing League: within the clubs you are getting closer together as members; the competitions are also a platform for the presentation of the club to the outside world, beyond the sailing community; and because sailing has finally arrived primarily in the general media locally and nationally, everything in sailing is gaining great exposure as a family activity. How seriously do the best German clubs take the competitions, for example the Bundesliga races next weekend in Berlin? 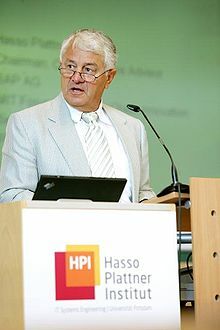 On the terrace of the organizing club, the sailing competitions are transmitted “live” via 60” LED monitors to the public with Hasso Plattner’s SAP Software Ag company providing the tracking and analysis software. And, if anyone ever puts some of the best German sailors on the Great Wannsee against each other, even the best of the past will celebrate that anniversary. Fifty years ago VSaW member, Willi Kuhweide, won gold at the Olympics sailing in Tokyo, Japan. Even five decades after his triumph in Tokyo, the aura of his success has still not faded. On the contrary, Kuhweide, today, is still synonymous with the international success of German sailors. His VSaW sailing club will celebrate this famous anniversary in parallel with the J/70 Segel-Bundesliga regattas. And Kuhweide, who now lives in Arizona (America), will be traveling to the festivities. He will also take part against his one-time closest rival, the East German sailors Bernd Dehmel! The erstwhile opponents are likely to be surprised by how professional sailors must be today in order to have success. "At the time, when Willi Kuhweide took Olympic Gold and later won the Bronze Medal, they had nowhere near as much training as sailors have today," said Ulrike Schumann. “However, no such service were offered to the athletes back in their time. For the J/70 Segel-Bundesliga regattas, for example, the 18 yacht club teams no longer need to bring anything but their sailing clothing! The J/70 boats are provided at the respective venues ready to go. A cooperation with the manufacturer of the boats makes this possible,” she says. To build upon the successful times of Kuhweide and Jochen Schumann, the aim of the German Sailing Association and Sailing Team Germany is to elevate the sport within Germany. The J/70 Segel-Bundesliga plays a role in this context. The great stadium-sailing format attracts a lot of viewers and, unexpectedly, enormous public interest— thanks to modern technology. The last Bundesliga regattas in Travemünde were viewed by up to 25,000 people live on the Internet. "For now, that is a good number for sailing," says Schwall. But, also in Travemünde were many public visitors that were present; they were also able to experience the Bundesliga sailing very close in perfect conditions. 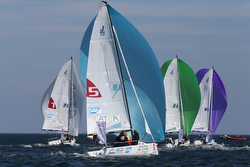 As a partner, SAP Software AG (Chairman/ CEO Hasso Plattner owns a J/105 and J/125) has used a combination of wireless WiFi and their world-renowned database technology to provide real-time tracking and standings of the teams on a “mark-by-mark” basis (e.g. you know how each team is winning or losing the entire regatta each time they pass a mark!). "We need to bring the sport of sailing on land," says Schwall. In Travemünde this requirement was met in spades. The observers ashore were especially satisfied, especially as the regatta unfolded quite dramatically on the water. The success of the Bundesliga, meanwhile, has spread abroad. In Denmark, there is now a similar league. Austria, Sweden, Czech Republic, Russia and the United States will soon follow. In Europe, like football (soccer to Americans) a Champions League is evolving. A first test for this is to take place this fall in Copenhagen, Denmark on the J/70s (12 boats and 24 teams total). (Chester, Nova Scotia, Canada)- As can often happen way, way Down East, it’s always a bit of a “roll-of-the-dice” whether you have a week of foggy dew and no wind or a simply spectacular stretch of weather that seems to make for an endless, perfect summer! Somehow, the sailors in this year’s Chester Race Week just south of Halifax, Nova Scotia were treated to one of their best sailing weeks in recent memory. As a consequence of being blessed by the best that Mother Nature can deliver, one of the best “social/ party” race weeks on the North American calendar went off without a hitch and with many J/Teams collecting way more than their fair share of silverware. 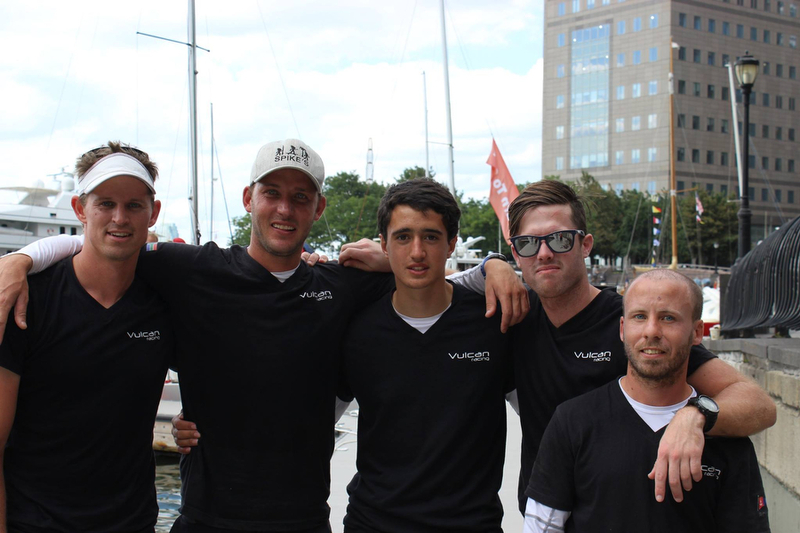 In addition, the Canadian J/24s were simultaneously hosting their 2014 Canadian Nationals. Starting from the first day, the week got off to a great start. According to One-Design Course Race Officer Brian Todd, sailors were treated to near-perfect conditions, “we had excellent winds, 8-11 knots, and racing was tight, and fun. My race committee team was fantastic, constantly adjusting the course to make it perfect for the sailors.” After the first day of racing, Lunenburg YC’s John Whynacht on the J/24 STICKY FINGERS took the class lead, never to relinquish it for the rest of the regatta! For many of the J/Teams, the second day of racing was thrilling and challenging! For other fleets, too much wind and waves forced cancellation of races and for others it also meant lots of broken rigging or torn sails. PRO Liz Shaw said that while conditions were challenging, and the incidents heartbreaking to watch, the high winds made for some exciting racing. “On heavy air days like today, the adrenaline is a little higher. It’s not about who has the fastest, lightest boat, it’s about who is mentally and physically prepared to sail in tougher conditions. Sailors are pushed to their limits and you can really see their tactical brains at work. It’s pure excitement,” commented Shaw. After the rough and tumble second day, the breeze lightened up for the third day of racing. Starting out with a wee bit of clouds, rain and no wind, the harbor postponement was finally lifted as the sun poked through and a nice breeze built for the afternoon. Most fleets managed to get in at least one race and fleets like the J/24s managed to get in two before the breeze died. For the J/24s, it was becoming apparent that Whynacht’s STICKY FINGERS was in a class of their own, posting two more top three scores. Mother Nature again delivered in spades on the final day. Conditions were great with a nice, steady southwest seabreeze, and winds of 15-20 knots. Most courses ended up finishing in a short rain squall under black skies and rainy, blustery conditions. But, it passed quickly and blue skies returned in time for trophy presentations. J/Teams reveled in the wide variety of conditions, especially the teams sailing the PHRF Distance races, random-leg courses selected before the start of each day’s race. In PHRF A1, the J/120s cleaned house, taking 1st and 2nd. Richard Calder’s BRILLIANCE and Dwayne Smithers’ ADIOS tied on points at ten apiece, with the tie-breaker going to BRILLIANCE. Fourth in class was Paul Rafuse’s J/109 WISC. 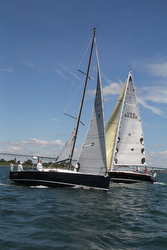 In PHRF A2 were a trio of J/35s that customarily do quite well in class. However, this year the top banana was Thane MacDonald’s J-HAWK, top J/35 but only 7th in class. In the nearly all J/Boats PHRF A3 class, it was “local hero” Colin Mann winning with his J/92 POOH STICKS, followed by Sean McDermott’s J/105 McMAC in 2nd and Jim Snair’s J/88 PLAYMATE in 3rd. In fact, the J/88s took three of the top five spots, Dave Connolly’s J/88 CRAZY EIGHTS in 4th and Terry Mckenna’s DOG PARTY in 5th. 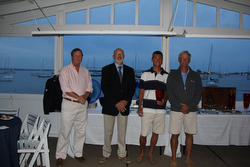 PHRF A4 class was also determined on a tie-breaker, with Chris MacDonald’s J/29 SCOTCH MIST IV taking class honors. On Course Bravo were the PHRF Buoy Racing fleets. In PHRF B1, the fleet was treated to a “schooling” by the J/29 SILVER WOMAN skippered by Andrew Childs; nine bullets in 11 races gave them a 14 pt lead over fellow J/29 sailor Don Williams on PARADIGM SHIFT. Fourth and fifth, respectively, were also taken by J/29s-- Erin & Carlisle Norwood’s FAVOURITE CHILD and Paul Dexter’s PAINKILLER. The PHRF B2 class had two J/30s sail well to take two spots on the podium. 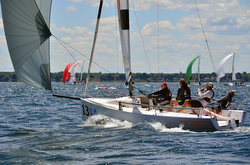 Jordan MacNeil’s J/30 FLUX was second and Jesleine Baker’s J/30 JUST ADD WATER was third. 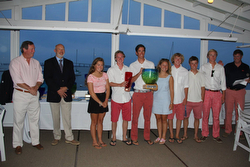 J/111 ODYSSEY YOUTH CHALLENGE Wins Ida Lewis Race! J/88 McMICHAELS YOUTH TEAM Takes 2nd! (Newport, RI)- This year’s Ida Lewis Distance Race was blessed by amazingly beautiful sailing conditions. Starting out in a strong southwester blowing 15-22 kts, the fleet took off at noon and into the sunset far offshore, seeking their first “mark” of the course— a “virtual mark” they had to navigate around using the GPS (hopefully accurate). The “virtual mark” added an intriguing new twist to the 10th Annual Ida Lewis Distance Race (ILDR). The popular overnight race took the fleet of PHRF, IRC, One-Design, Double-handed and “Youth Challenge” boats on one of four courses – between 104nm and 177nm – that trace the New England coastline. First boats in the fleet were finishing by Saturday morning and most everyone finished by the evening— a fast, fun race for all with many J/teams reporting surfing or planing into the mid-teens on at least two of the legs! The report from the J/88 was equally enthusiastic. In this case, the J/88 offshore experience was a “family affair”! Here is the commentary from skipper Rick Fleig, “the race turned out to be a spectacular Ida Distance Race on the 88! What a terrific boat. I had gone on out on the 88 last summer on a few demo sails for some prospective clients, but putting her through her paces in the ILDR was fantastic. We had a great start, though in retrospect both Steve & I said we should have tacked onto port right after the committee boat’s anchor line to keep our air clear as we stayed on the starboard board a little too long and got run over by a 45+ footer and then sat in some bad air for a while. We also should have sailed with the 95% heavy blade jib - we didn't and we were on our ear most of the time upwind for the first few hours. Certainly a mistake in those conditions with only four aboard, two of which were teenagers. Regardless, we had so much fun and the boat was really a joy to sail. We hit 17.5 knots on the first long run to Buzzards Bay Tower with my son Tyler notching the high speed for the race!! Awesome stuff! All that downwind Laser practice pays off even in big boats! We did a few round ups on that leg with Steve, myself and Tyler all contributing, as it takes a little getting used to feeling the rudder load up as you come across the wave face, heating it up, and then running back down. We learned that you have to feel the load and then carve down slowly to get the best performance. Steve was turning hard down the wave face Laser style and it wasn't as effective as carving a slow turn down and holding onto the wave and plane. Fun stuff!! All that in only 15-18 knots TWS, simply an amazing boat!! Just a little more breeze and time on the stick and surely we would have hit 20 kts boatspeed easy downwind! To sum up - we missed first place in the division by 11 seconds to the J/111 ODYSSEY! And, when I suggested to Steve, his son John, and my son Tyler that we should do it again next year in a bigger boat, they all said in unison, ‘No way - this boat is awesome!’ And, I have to say, I agree! In addition to the 88 and 111 sailing the Youth Challenge, there was quite a line-up of eleven other J/Teams that participated in the event (30.0% of 53 keelboats)! In the IRC Division, Paul Milo’s J/122 ORION took a 7th in their 14 boat class. Then in PHRF Division, Bob Manchester’s J/120 VAMOOSE took 3rd, followed by Paul Grimes family crew on their J/35 BREAKAWAY in fourth. 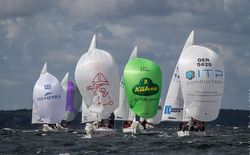 (Angelholm, Sweden)- This past weekend, a fleet of thirty-five J/24s assembled in the beautiful little seaside resort of Angelholm, Sweden to compete for the J/24 European Championship. Conditions ranged widely from gales and thunderstorms to gorgeous sunny days with moderate winds. Topping the standings was the American team of Mike Ingham, comfortably winning the regatta by 30 points over the next boat- as a result the winner of the “Open Europeans”. The top European boat was Germany’s Frank Schonfeldt from the Muhlenberger Segel-Club sailing HENK. The first day of racing started out with a postponement due to gale force winds and lightning. But, once the first warning signal sounded the three races scheduled for the day were carried out without further delays. As a result, the strong breezes persisted for most of the day and it forced many crews to choose between the 150% genoa or the 100% jib; crews were often madly running around on deck just before the start hoping for a last-minute advantage (hanks aren’t that easy to swap out!). The first race was won by Mike Ingham’s USA 5443 (USA), followed by Manfred Konig’s VITESSE (GER) and Frank Schonfeldt’s HENK (GER). The second race was won by HENK, followed by VITESSE and QUICK & DIRTY. Then, the third race of the day saw a different combination, it was won by Chris McLaughlin’s IL RICCIO (last year’s 2013 Europeans winner in Monaco from GBR), followed by Ingham's USA 5443 and Tobias Feuerherdt’s TEAM ROTOMAN (GER). The results after the first day showed that German teams were in 1st and 3rd (Konig’s VITESSE and Schonfeldt’s HENK, respectively) and in 2nd was McLaughlin’s IL RICCIO. 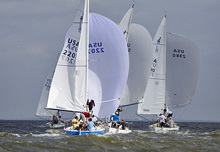 Race day two offered strong breeze but no rain and the event was able to complete four races. The crews were clearly exhausted after that long workout! Race winners were: R4– VITESSE; R5– TEAM ROTOMAN, R6– USA 5443; and R7– Till Pomarius’ TINTO from Germany. After the second day of racing, Ingham’s USA 5443 surged into the overall regatta lead due to their finishes of 5-3-1-6, followed by VITESSE and TEAM ROTOMAN. At this point, McLaughlin’s IL RICCIO had accumulated two scoring penalties in race 2 & 4, took a DNF in race 5, then unfortunately DNS’d the rest of the series. The third day dawned just as nice as the day before, great winds of 12-20 kts with lots of sun and two more races that started on-time at 11am. In addition to the usual suspects who occupied most of the top three spots, new faces included Johann Huhn’s HUNGRIGER WOLF from Germany taking a 3rd in R8 and Peer Kock’s German team on UK GISCHT & GLUT taking a third in R9. At this point, Ingham’s 1-2 score for the day simply drove them further ahead of the rest of the pack. Amazingly, the last race day offered more of the same weather! Imagine that?! With great winds and sunny skies, the sailors could not have been happier, plus the beaches were packed with lots of beautiful Swedes vacationing immediately in front of the harbor entrance. Two more races were scheduled and were carried out without delays. The day’s winners saw a number of new faces in the crowd. In R10, Matthias Garzman’s GUNNI (GER) won, followed by Per-Hakan Persson's FRONT RUNNER (the top Swedish boat) and Jan Kahler’s UNITED 5 (GER). In the last race R11, UNITED 5 took the bullet followed by USA 5443 and HENK. In the end, Mike Ingham’s American crew were crowned the overall Open J/24 European’s winners. The top European and the next three positions were dominated by German teams; Schonfeldt’s HENK crew in 2nd, Konig’s VITESSE in 3rd and Kock’s UK GISCHT & GLUT 4th. Fifth was the top Swedish boat, Persson’s FRONT RUNNER from the Malmo Sailing Club. Top prize for best Women’s crew went to VEGA RAGAZZA– Stephanie Koepcke and her lovely crew from Germany’s Muhlenberger Segel-Club- she finished 10th in a highly competitive J/24 fleet! Top award for best Youth Team went to LUV– Tom Stryi and crew from Germany. 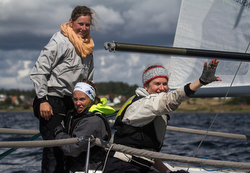 Stewart and Mary-Anne Jardine’s “Old Boat Trophy” for inspiration to the J/24 class went to the Swedish all-women crew of FOR FUN (BLUE)– Liselotte Sjöberg and crew. 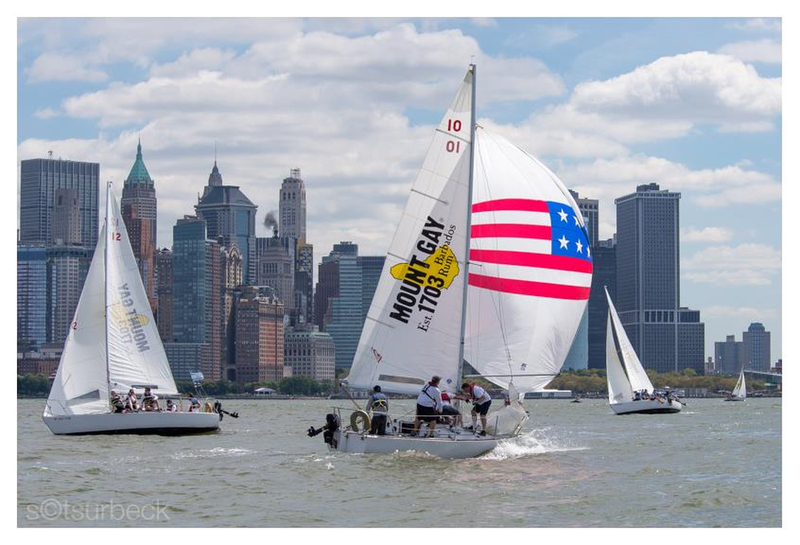 (New York, NY)- Last weekend, nineteen teams of amateur sailors from 14 nations sailed in the Sixth Dennis Conner International Yacht Club Challenge in absolutely gorgeous sailing conditions on the Hudson River, right next to the famous Statue of Liberty. The races took place in Manhattan YC’s bright red J/24s; races were started off their famous floating clubhouse, the Sparkman & Stephens designed “Honorable William Wall”, anchored in New York Harbor just north of Ellis Island. 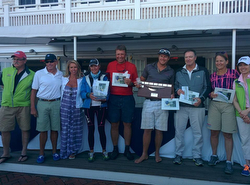 Winning the regatta with considerable ease was the Royal Cape Yacht Club from Capetown, South Africa. How did the South African team do it? By sailing fast and smart and avoiding any un-necessary mistakes. This dark horse was a well-practiced team, all used to sailing big waves and even bigger winds off the tip of Capetown; a place renowned for nasty gales, chilly winds, and “jumping great white sharks” feeding on innocent little seals off the infamous Shark Island (often seen getting “big air” right in the middle of some of their race courses)! Needless to say, not much was going to intimidate this team of one-design and offshore sailors. The South Africans arrived to the regatta without fanfare and at the Opening Ceremony, described themselves as the “most humble” team at the regatta. They told the story about how they scraped together funds for their 36 hour flight to New York City by soliciting donations. They were surprised by the many generous sources that collectively made their participation possible. Despite their challenges, they easily led the regatta after sailing three races on the first day- posting a 5-2-1. Not a bad score considering none of them had ever sailed on the Hudson River before! Over the next two days, they never slowed down, adding a 7-2-2-1-2 to close the regatta with 15 pts net and win by a stellar margin of 5 pts. Starting out in second after the first day were the Royal Danish Yacht Club team from Denmark. They managed to post very consistent scores of 4-4-2-2-3-4-8-1 for 20 pts net to secure a firm grasp on the silver overall. Third place and the balance of the top five saw just about every team experience some amazingly bad races; as the Aussies often say, “we sent it down the mine shaft!” After day one, the Manhattan YC #2 team was third with a 1-9-3, but then disappeared into the abyss on day two with an epochal record of 17-13-8 to take themselves out of contention (hmmm, rumor had it they were showing some of their newfound foreign friends a good time Friday night in downtown Manhattan until twilight?). Howth YC from Howth, Ireland, a hotbed of J/24 activity in that island nation and recent host of the J/24 Worlds, also started out strong with a 2-6-7-5, temporarily holding onto third place after four races. Then, they bombed two races, gathering a 17-3-18-3 to drop themselves into fifth overall. (Copenhagen, Denmark)- For the first time in European sailing history, the top European sailing club will be identified at the new SAILING Champions League, which takes place from 17th to 19th October in Copenhagen, Denmark. 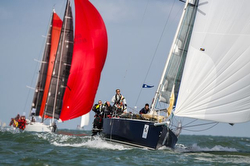 Together, the German Sailing League (Deutsche Segel-Bundesliga), the Danish Sailing League (Sejlsportsligaen) and the European Sailing Federation (EUROSAF), are inviting 36 of the top sailing clubs, from 23 nations, to Copenhagen to compete for the title of “Best Sailing Club”. The introduction of the SAILING Champions League (SCL) follows shortly after the national sailing leagues successfully started in Germany and Denmark. The first league was the German “Deutsche Segel-Bundesliga” (DSBL) in 2013. The format was the idea of marketing agency “Konzeptwerft”, in association with the leading German yacht clubs and the German Sailing Association. “After a very short time, we received inquiries from all around Europe and even from the USA and elsewhere outside Europe. Denmark was the first country to adopt the German model. 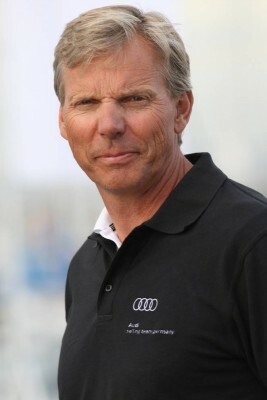 The logical conclusion of this development is to create the SAILING Champions League, which will become the European league for the champions of the leagues in each competing country,” explains Oliver Schwall, CEO of the SCL (“Olli” is also an International Tornado Class World Champion, one of the world’s fastest one-design catamarans). The SAILING Champions League will take place for the first time in Denmark. Hosts are the German and Danish sailing leagues as well as the Royal Danish Yacht Club (KDY). “We will invite leading yacht clubs and are expecting sailing at the highest level,” says Lars Ive, Vice Commodore of the KDY. “The conditions for a regatta of this size are ideal in Copenhagen”. Each participating club will send a crew of their four best sailors. They will sail in fleet races in Copenhagen on six J/70 one design sailboats, which have proven their worth in the leagues. Short races, one-design boats and a standardized race course, will provide high-level competition. “The clear and simple concept of the German’s has motivated us to create the ‘Sejlsportsligaen’ together with the founders of the DSBL,” states Hans Natorp, President of the Danish Sailing Association. “The SAILING Champions League will convince further countries to establish a national sailing league”. 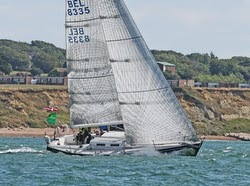 (Cowes, Isle of Wight, England)- As of Thursday evening 2100 hrs BST, six yachts are still racing in the Sevenstar Round Britain and Ireland Race and after light winds slowed their progress yesterday (Wednesday) morning, the wind picked up overnight much to the delight of the remaining competitors. The J/111 BRITISH SOLDIER and the J/122 RELENTLESS ON JELLYFISH are having a tremendous battle in IRC Two and the three remaining Two-Handed teams are making great progress. 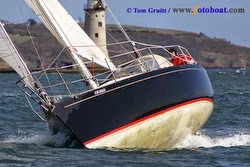 The “Jellyfish”, skippered by James George, had an excellent night Wednesday. Gybing north of the rhumb line, the Jellyfish made a massive gain over the U.K. Army Sailing Association's J/111 BRITISH SOLDIER. At dawn Thursday morning, Jellyfish was the first yacht, still racing to pass the Scilly Isles. Over the last 24 hours, the Jellyfish gained 26 miles on their rivals to lead the six yachts still racing. "We can see BRITISH SOLDIER’s kite behind us for the first time and we are now in 10 knots of wind planning on how to tackle the headlands along the south coast of England," commented James George. "We are determined to take line honours for the class, morale is good but it's tense on board, we know we have a real fight on our hands with BRITISH SOLDIER. It has been one hell of a race and we want to finish on a high, we are just trying sail fast and hang on to this lead." 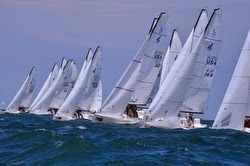 (Chicago, IL)- The Verve Cup Inshore Regatta is a spectacular sailing event. Hosted by the Chicago Yacht Club at Belmont Station each August, the Verve Cup is the most popular inshore regatta in Chicago. While some of Chicago’s older one-design fleets are participating, all with hugely diminished participation rates, the big news are the J/70s! With eighteen boats registered, the J/70s are the “talk of the town”, the biggest city in the American Midwest and known as the “Windy City”- mostly for its reputation of politicians blustering all manner of vacuous “hot air” (e.g. "talking the talk versus walking the walk"). Nevertheless, the sailors are the real thing, and when a number of leading teams in the Chicago area decide to move forward and support class development, things happen. In the case of the J/70s, the class has developed a very strong local following with many leading the class on a national basis. It will interesting to see how the Lake Michigan J/70 sailors tackle this weekend’s weather forecast. While Friday and Saturday may produce light to medium winds from the northeast as part of a massive thunderstorm complex moving through from the Canadian Prairies, Sunday at least promises beautiful sunny skies with mild temperatures and breezes from the southeast (a classic direction for Chicago sailors). Top teams surely include Bob Hughes from Macatawa Bay, Michigan sailing HEARTBREAKER. Bob is renowned for having sailed J/35s, Farr 40s, Melges 32s and, most recently, a TP52 in this year’s Chicago-Mac Race of the same name. Challenging Hughes will be a member of the famous Londrigan family (Star World and J/109 Champions), Tom Londrigan from Island Bay YC on POLARIS. From Wilmette, IL and sailing for Chicago YC will be John Heaton on EMPEIRIA. Lasse Berthelsen from Norway will also be sailing NOR 645 and Leif Sigmond will be racing NORBOY. Blane Shea is racing GEMINI, a fast, up & coming young sailor in the 70 class. What is also notable about the J/70 Chicago fleet development are “family-owned” boats (e.g. brothers, sisters, cousins, father/son, etc), like Martin & Jorgen Johnsson’s AQUAHOLIKS from Lake Forest YC, Jeff & Mark Veenstra’s J’HAD from South Shore YC in Milwaukee, and Ryan & Bryan Frey’s JOHNNY UTAH from Chicago YC. For Chicago history buffs, “family” is important in Chicago sailing circles— even guys like the famous Italian mobster Al Capone purportedly loved boating with his friends between doing not so nice stuff. (Muskegon, MI)- The Muskegon YC will be hosting this year’s J/35 North American Championship from August 21st to 24th on the beautiful, crystal-clear, Caribbean-blue waters of Lake Michigan. Situated on the eastern shore of the lake, Muskegon enjoys the twin benefits of having the prevailing strong westerlies that develop over this large inland sea to provide big waves and big winds for the sailors. In addition, if dying cold fronts lose their steam, the enormous sand dunes along the eastern side of the lake form perfect “heat sinks” that help produce strong thermals along the beach from the SSE all day long. In for a treat will be a very strong fleet of eight J/35s, amongst the best in the greater Midwest and including amongst them numerous Chicago-Mackinac and Port Huron-Mackinac race winners as well as several past J/35 NA winners. The only visiting team from Canada is Bob Vander Ploeg’s BOBSLED from Thunder Bay YC, Ontario. They will be up against a rogue’s gallery of J/35 teams from the Lake Michigan fleet, including Larry Taunt’s BAD DOG from the host club, Bruce Metcalf’s BOZO’S CIRCUS, Dave Timmer’s HAT TRICK, Jack Andree’s HOUQUA, and Gregg Whipple’s WHIPLASH. Challenging the Lake Michigan contingent will be two very good Detroit (Day’twah) boats, Ed Bayer’s FALCON and Bill Wildner’s MR BILL’S WILD RIDE. Don’t let these guys fool you, they really do know how to sail their boats fast no matter how much beer you serve them!! J/36 JAZZ Sailing Med to UK Singlehanded! (Plymouth, England)- Now this is one famous boat. Originally owned by J/Boats co-founder Rodney Johnstone, the J/36 JAZZ has sailed all around the world. In recent years, she has spent her time between the Med and the UK. Her current owner, Norman Curnow, loves doing the 2,900nm voyage single-handed voyage. His wife does not seem to mind as she goes via British Airways. As he describes, “if I can do it single-handed, then any one can Crete and back single-handed 5,800 nm. All the same gear that was on boat in 1980- including the new Shore Sails— made by Bill Shore, right?” (Editors note- this famous loft was sold to North Sails and included Ken Read and Dan Neri, amongst others, in the transition a few moons ago). Sunday Sailing: Family Fun Team Goes Big Time. 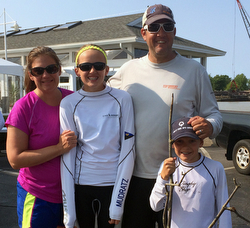 In truth, the incentive behind packing up our young family— 11 year old Lily, 9 year old Dylan, and my wife Cindy— and driving six hours to the Rochester Yacht Club for the J/70 North American Championship was more selfish then selfless. Sailing and family are two passions that there just never seems to be enough time for. By finding a way to combine them, maybe I could find the best of both worlds? So we packed up boat and family (not as easy as it sounds), and when we got there I rigged by myself while they played. We have been sailing our J/70 Torqeedo for almost two years now. Each event has been labeled a family vacation with the focus on fun, learning, and spending some real quality time together. Secretly I’m hoping to plant the seeds for a future championship team, but there’s no need to inform the crew of that goal just yet. For now, setting more modest goals has become part of our pre-regatta ritual. Of course at this event Dylan decided to announce his arrival by walking up to class champion Tim Healy of North Sails and proclaiming, “We are going to give you a real run for your money this time.” (I swear I have no idea where the kid gets that kind of attitude.) I have to laugh at how far his expectation levels have come from our first J70 event, where this same boy declared that coming in last was just fine with him… as long as a trip to the pool was on the docket for each day. With performance goals as clear as mud, sometimes it’s easier to focus on picking the right venue, because location is paramount to the success of our family trips. Yes, we try to find lighter air events… as we are a very small, very light, and sometimes even very scared team. But add in a family-oriented yacht club with a pool and an amazing loaner yacht for a crew camp out, and we had a perfect recipe for success. Our team continues to delight and amaze me every time we go sailing—and they attract the attention of the rest of the fleet too. 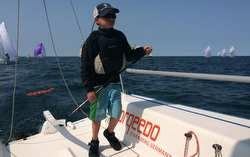 Dylan is a bit small for his age, and he likes to steer between races and downwind. When we sail by someone we haven’t raced against before, they stare at our little driver—who can barely see over the cabin house. But it’s our daughter who has learned the most from our regattas together. Lily is very attentive to details, and when setting the spinnaker for our first day of practice she noticed that the sheets were led wrong and soon would be a massive mess. She went right to work on making it right, all on her own. That problem-solving ability is not something kids can pick up on the ball field or in the gym today. Even more impressive is that Lily has grown into our team’s tactician. Together we have a pre-start routine where we look upwind and compare thoughts on what we each see. Early on this started with a lot of “I’m not sure Dad, it all looks the same,” and then that grew into “It looks a bit windier on the left.” Now the conversation has matured all the way up to “Big hole in the middle, Dad, and more breeze on the right… let’s take that one around to the top.” It’s hard to believe this is the same girl who just a few years ago could not tell me where the wind was coming from! One of the best moments of the week happened on the second beat of a shifty race. Lily thought there was more wind to the right and asked me to tack for it. Without looking, I trusted the sound in her voice and rolled the boat into a turn. That decision helped us pass fifteen very well-sailed boats. As we tacked back and crossed Rolex Yachtsman of the Year Jud Smith, the inside of me was burning with sailor-dad pride. Our crew work has also improved the past few years. The family has learned a lot about how one person’s job affects the other. By taking ownership of our roles and working together, the little things are now getting done right and everyone’s job is a lot easier. No longer are our maneuvers something that could be featured on TV’s best Fear Factor moments. As our crew work has improved, so have our results. 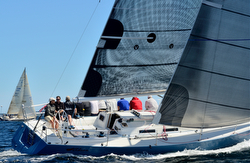 At the North Americans, our first finish was a 26th in a deeply talented 70-plus boat fleet. The rest of the family honestly did not think it was that great a race for us—though I knew from previous NAs (with a pro crew of friends) that anything in the top 30 was a keeper. It turned out to be our best finish of the series. Now, I have been humbled by good, big fleets before, but this was a new experience for my family, who had gotten used to finishing in the top half at smaller regional events. So we had the conversation about how sailing against the best is how you improve. We talked about how everyone at such a big event was really good, and that we needed to work on the finer points of changing gears and perfecting mark roundings to take that next step. No one on our team wants to settle for just finishing a race; that’s not all right with them anymore. The game is on, and climbing the scoreboard ladder is now a big part of the fun equation. My wife Cindy is a sailor by marriage, so her litmus tests for success are much easier to achieve. She loved being part of a big event with a lot of boats. She found it very exciting when compared with local racing, as there was always a lot of action going on, and it was easy to tell when we did something right or made a mistake. However, she still loves the simple part: being away from it all and being together on the water. Getting hugs on the rail easily outweighs getting yelled at by the skipper for blowing a tack at “just” the wrong moment. Our story would not be complete without sharing one of those “wrong” moments. It was race four, and we had gotten a great start. So “There We Were,” approaching the windward mark in the top 10, surrounded by many of the best sailors in the world. As we tacked onto the layline the boat started to go slower and slower and slower. At first we thought maybe it was just bad air from the leaders. Then we started to get passed by boats both to windward and leeward, and we knew something was really wrong. We finally spotted a small tree (taller then Dylan, as you can see from the photos) stuck on the keel. After trying to back down (and losing 30 boats really fast), the problem tree was still there. I finally had to jump into the water (to the horror of the kids, who did not think I was going to come back) while the other 40 boats went by. To make a long story short, we went from top 10 at the first mark to dead last (71st) at the second mark. Not a pretty sight. J/24 BANDIT Wins “Race To Pub”! J/24 Sailors a bit too far “Down Under”!? 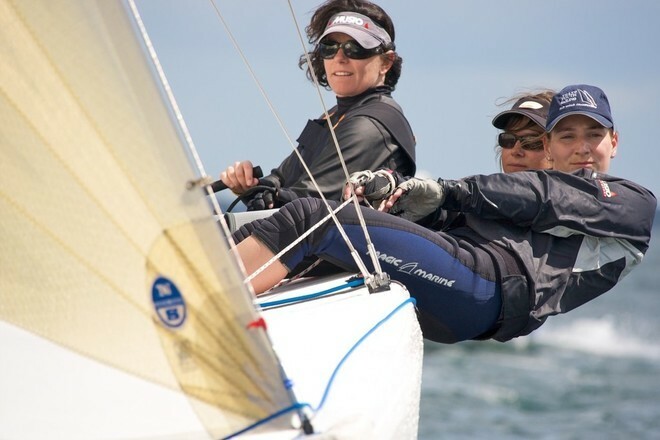 Empowering Women In Sailing- WOW! Russian J/70 Sailing League Starts! 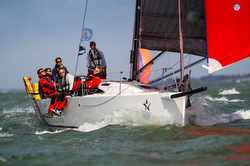 Sparkling Cowes Week For J/Sailors! J/70s Growing Sailing in Chile! J/70s Growing Sailing In Italy! J/Sailors Leading the Charge off Nantucket. 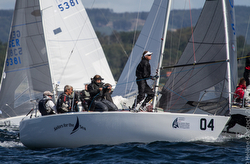 J/24 CHAOTIC Savors Taittinger Champagne Victory! J/130 RAGTIME Dominates Brisbane to Keppel Race! JITTERBUG Crowned J/111 European Champion! Bacon Brothers Rock Sailing World! Hutchinson- The Weekend Sailing Warrior? J/Teams Love Adult Sailing Camp! J/111 WICKED 2.0 Round Island Champion 2x! J/42 JAYWALKER Cruises Ugotta Regatta! J/111 KINETIC Gulfstreamer Race Winner! J/34 IOR Boat Sailing In Toledo! CIRCE’s CUP Crowned Marblehead NOOD Champ! SEAWEED Is J/88 Great Lakes Champ! WIND CZAR Repeat J/111 NA Champion!